Modern or rustic, country or city, the magic of the deck does not distinguish styles. It is an all-terrain and you can take over the edges of a pool, a space in the middle of the garden or a corner of a terrace or balcony. In addition, it is undoubted the warmth it causes, as well as its direct connection with nature. Usually, they are used as a resource to prolong interior spaces, cover unwanted views, create new environments, sectorize and frame stonemasons. As its assembly is with dry work, the transformation of space has the advantage of being carried out quickly and easily. The construction of a deck is an excellent decision that undoubtedly revalues ​​and prioritizes any property, providing an excellent aesthetic that adds warmth and blends with the natural environment of a garden. As far as colors are concerned, they are very varied and anyone can do it in wood. However, considering the high sun exposure of this type of flooring, it is advisable to use products with high pigmentation and dark tones, since the pigments help to protect the wood from the sun more. With regard to the wood used, it must always be prepared and treated for its exposure to the outside in order to withstand climatic demands such as rain. It is important to differentiate between the wood used for the pillars and the wood that makes up the platform: pine impregnated with CCA, pine, incense, lapacho, quebracho and timbó are the classes that are most used for the construction of decks. Branson’s Building Materials offers top quality building materials at excellent price so you can complete your house renovation successfully. 1) The deck must be not less than 15 cm raised from the natural floor or subfloor and supported by slats that allow the wood to be aerated when separated from the ground. 2) The drainage slopes must be respected. If a deck does not have a minimum slope for the water to drain, the accumulations of it generate problems of use and drying. 3) For the protection of the atmospheric agents a product specially designed for that purpose must be chosen, that supports the abrasion and not any protector. 4) All the pieces of a deck (support strips, nailing strips, visible slats), must be preserved and protected with the chosen product at least in one hand, but in two before the assembly. In this way surfaces that are then inaccessible will be protected. 5) Also, if possible, it is important to consider the assembly of the deck in parts, so that they can be removed and lifted for maintenance tasks. If this is thought from the design the task is easier and does not require the dismantling of the structure. If you are thinking about incorporating a wooden deck in your patio or garden, we bring you 5 tips so you can design it and protect it in the right way for its longest duration. The deck will never be directly on the ground, but must be at least 15 cm away from it. For this, it is necessary to support it on slats that prevent the direct contact of the wood with the humidity of the surface of the earth. It is best to build the structure on special cement piles to mount decks. These will avoid contact with the ground and permanent moisture that could damage the good condition of the lower structure. Water is one of the main threats to wood. To prevent accumulation and generate moisture problems, it is important to respect the slopes so that the water runs off accompanying the natural terrain. In this way, no water deposits are generated below the structure that could damage the natural fibers of the boards and strips. A crucial point: all pieces must be strictly protected with one or two hands of a product specially formulated for decks or exterior wood surfaces. It is important to do so before the structure is assembled, since the protection must include the surfaces that will be inaccessible, such as the support strips, the nailing, and the underside of the wood. 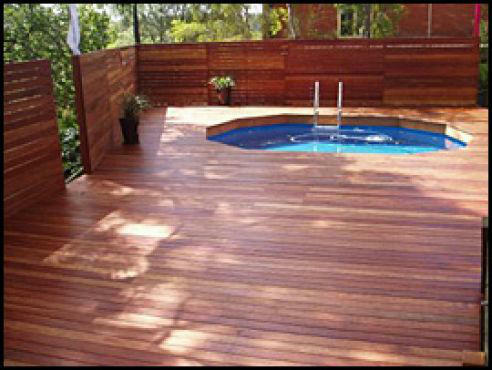 If the deck will be used in the yard or garden, it is important to ensure that it is resistant to atmospheric factors such as sun, rai-n and abrasion. A good product or varnish will preserve the natural appearance of the wood in addition to its protection. It must repel water and prevent the formation of fungi. In the packaging of the special varnish or primer that you use, you must show that your formula has a UV filter to prevent discoloration of the wood, in addition to a high resistance to traffic and long duration. This may vary according to the personal taste of each one. You can give it a satin or shiny finish. Usually a satin finish highlights the color and veins of the wood, making it look more natural, colorful with a soft and subtle shine. The glossy finish is much more visually luxurious, and repels stains more easily. Call us now and get more information about our services.